Mark Evans has this to say “The scent of wintergreen essential oil would be immediately recognisable to many of you, especially if you go the gym! The main component of the oil is methyl salicylate which is also used in many of the muscle pain relief rubs in the market. You know that smell that lingers around the office when someone has worked out too hard and is suffering the next day. Strangely enough, a wintergreen leaf itself is virtually odourless. However, when the leaf is chewed a chemical reaction occurs to release the methyl salicylate and the characteristic wintergreen odour and taste is noticed. The American Indians knew this and used to chew the leaves for pleasure and also taught early French explorers how to create an infusion of the leaves in hot water which they then named “thé du Canada. Safety Data: Under no circumstances should wintergreen be used on infants or young children or anyone who is allergic to aspirin. 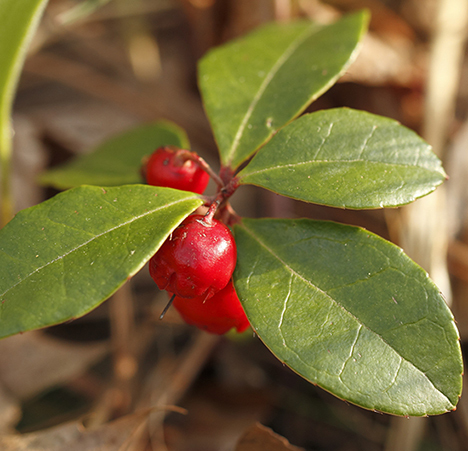 Never ingest wintergreen essential oil or use it neat on the skin and always blend it down in carrier oil before use. If in any doubt ask a qualified professional aromatherapist to provide you with guidance.